Brightly colored lanterns hang in the air at Jogyesa Temple in central Seoul. 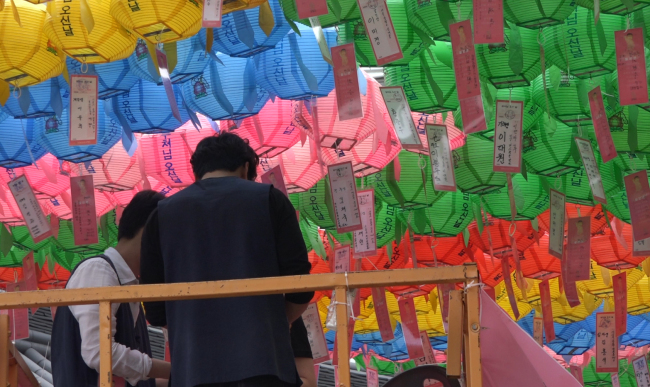 Seoul citizens flocked to the chief temple of the Jogye Order of Korean Buddhism to celebrate Buddha’s Birthday, a national holiday here that falls on May 22. People joined their hands in prayer, wishing for good fortune and blessings in the future, along with family members’ health and peace on the peninsula. Thousands of Buddhist followers and citizens attended the morning ceremony, according to Jogyesa Temple. Children participated in craft activities prepared by Jogyesa Temple. Buddhism was first introduced to Korea in 372, blending with Korean shamanism. Buddhism was supported as the state ideology during the Goryeo period, but was repressed during the Joseon era when Neo-Confucianism became dominant. Currently, the Seon school carries out disciplined practices in mountain temples around the country. The Taego order seeks to preserve traditional Buddhist arts such as ritual dance. 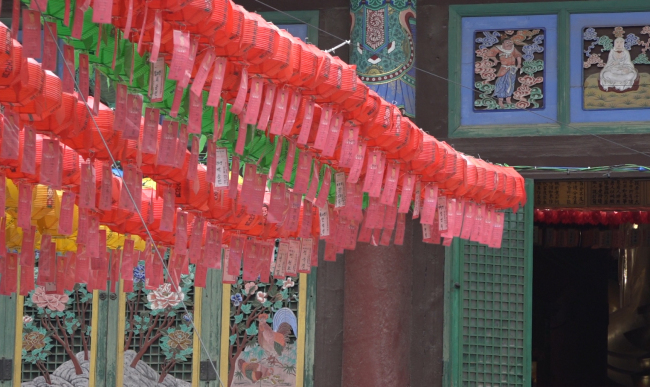 Many nonreligious Koreans visit Buddhist temples to enjoy a calming respite from the city.